Lock in a great price for Hotel Oversum Winterberg Ski- und Vital Resort – rated 8.6 by recent guests! Great location to near by attractions. Hotel was clean and quite. The breakfast was excellent both in food and service. Fabulous room with balcony overlooking the hills. Good internet. Decent sized room. Decent spa facilities- but not the most extensive. Comfy bar with fire place, great help at the front desk, correction of the bill (phone call at home as another family with the same name did have a Spa treatment). Super kind cleaning staff did a great job. Size and view of the room nice. Kids loved the material of the duvet cover. Pool has separate lanes for long distantance swimming; kids have their own pool in a different area. Dog was really welcome. The spa area, pools and sauna were all outstanding. Staff was very knowledgeable. Bought our ski lift tickets at the hotel. The room is big and clean, swimming pool is super. 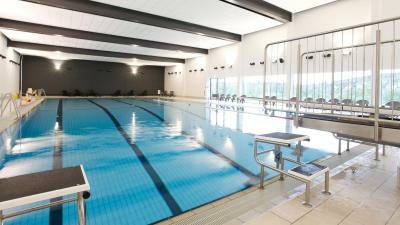 Friendly staff, great location and exceptional wellness area, loved the pool and outside sauna. Due to circumstances (fully booked) we had to take a suite on the 7th floor. It was certainly not cheap but very nice and comfy! We really enjoyed our stay and did not regret the amount spent. 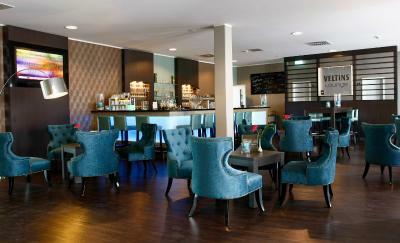 Loungebar with the fireplace is also very inviting..
War alles tipptopp! Wir waren sehr zufrieden. Im 5. Stock hatten wir eine Mega Aussicht! Hotel Oversum Winterberg Ski- und Vital Resort This rating is a reflection of how the property compares to the industry standard when it comes to price, facilities and services available. It's based on a self-evaluation by the property. Use this rating to help choose your stay! 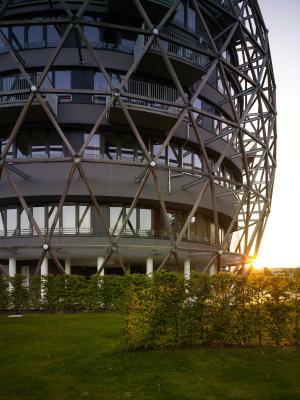 This architecturally unique hotel features a large wellness area with spa. 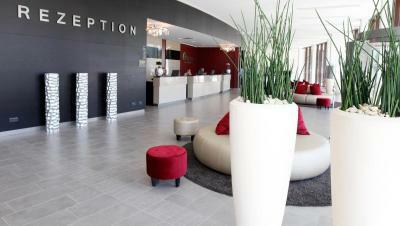 It provides modern rooms and suites with a view, excellent spa and fine regional and international cuisine. Featuring an egg-shaped exterior, all stylish rooms at the Oversum Vitalresort Winterberg feature large windows and a flat-screen TV with satellite channels. Bathrooms are en-suite and come with complimentary toiletries. 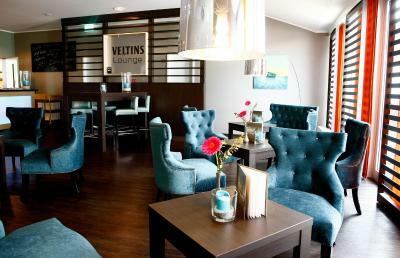 Oversum Vitalresort Winterberg features 2 restaurants as well as the Veltins Lounge bar. In sunny weather, guests can enjoy meals on the 2 terraces. An indoor swimming pool, Finnish sauna, aroma steam bath and spa showers are all featured. 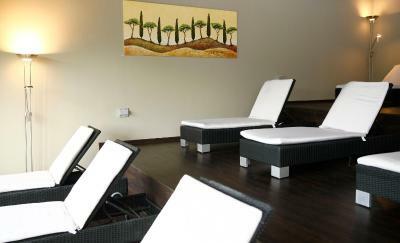 Massages can be booked at the hotel, and a fitness room is also available. Winterberg Train Station is 2,800 feet away. The surrounding North Rhine-Westphalia countryside is ideal for hiking, cycling and skiing. Ortsmitte is a great choice for travelers interested in food, mountain biking and walking. 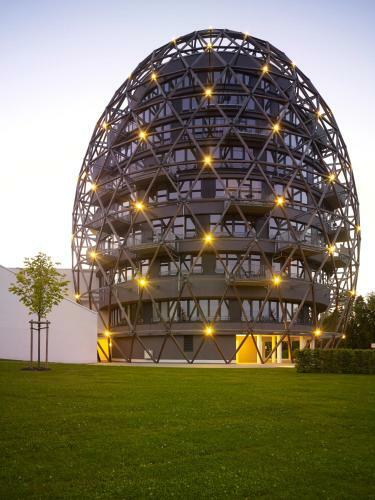 This is our guests' favorite part of Winterberg, according to independent reviews. 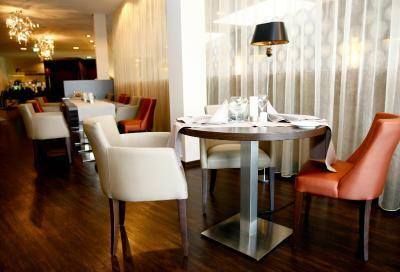 When would you like to stay at Hotel Oversum Winterberg Ski- und Vital Resort? Modern, stylish rooms with free Wi-Fi. Modern, stylish rooms with free WiFi. Offers extra space and a balcony. Offers more extra space and a balcony. Modern, stylish room with free WiFi. Hotel surroundings – This neighborhood is a great choice for travelers interested in food, mountain biking and walking – Check location Excellent location – show map Guests loved walking around the neighborhood! House Rules Hotel Oversum Winterberg Ski- und Vital Resort takes special requests – add in the next step! Hotel Oversum Winterberg Ski- und Vital Resort accepts these cards and reserves the right to temporarily hold an amount prior to arrival. Please note that for reservations booked without a credit card, the property may contact guests in advance with the details for a bank transfer. Please contact the property for further details. Our shower had a never ending supply of clumps of some sort on the tiled floor. Don’t think it was cleaned for some time. Unfortunate for such a “four star resort”. The breakfast is not value for a four-stars hotel, room is too small and tables are too nearby to each other, coffee glasses are missing too long time. It is not really organized in this area. Tea and coffee facility in the room would be nice. The food for dinner was not good at all! . Breakfast was good. Travel with my wife , my step mom and 2 children . We booked 2 rooms from Booking.com , one suit room (the biggest room they have shown in booking.com 62 sqm ) and one single room . When check out We were charged by 2x25 euro from 2children eventhough i had tried to explain that from Booking.com it shown allowance to be able for 3-adults and 2 kids in 2rooms ( suit and single room ) . I asked the reception staff for reason and she tried to explain polite and friendly but after she went to ask her chief that might be a manager and she (manager) come to me with unfriendly response and told me that was the policy and our room was not suit room whilst in Booking.com shown it was suit room !!! She said it was wrong by Booking.com . I asked her how to book a room for example if we travel with 2 adult + 1 child (5 years old) , she said must book 2 rooms , oh god ,and push any wrong information caused by Booking.com only . I am in the real estate business and have invested in some hotels in Thailand. So I have no problem with just only 50 euros charge if right information was given to us . By the way , overall hotel is good but not special , just another hotel in another night , but a manager was not so friendly and make me feel like being insulted . I travel almost around the world but never been react like here even I am Suite room guest . Here is not hotel for travel with kid(s) . Try another one . Spa opens at 11 in morning.